Is Your Web Truly World-Wide? The Reader team is happy to announce that another 20% project has come to fruition: automatic translation in Reader! Post by 20% volunteer and glottology expert, Brett Bavar. Believe it or not, the web truly is world-wide. That means there is a lot of interesting content out there in languages other than your own. You might have missed out on this content in the past, but now, with automatic translation in Reader, you don't have to miss a thing! Next time you find an interesting feed in another language, just subscribe to it as normal in Reader. 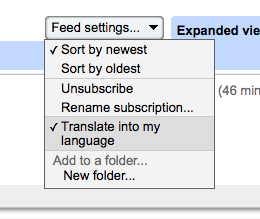 When you view the feed in Reader, check off "Translate into my language" in the feed settings, and (voila!) the feed will be immediately translated for you. Also, this setting will be saved so you can always view this feed in your own language. Many thanks go out to the awesome engineers on the Google Translate team, who have provided the technology to make this possible. As they continue to make their translation systems better, you will get to reap the benefits automatically. Have fun discovering all the great content out there on the truly world-wide web!